We don’t always realize how important a frame is for a painting. Very often the kind of frame, its size, material, and color, give the painting character. And just as a good frame draws out the qualities of a painting, so a bad one can completely ruin even a good work. In the case of Bernadetta’s work, this is significant in that her paintings sometimes open on to the frame, which, in this way, blends with the canvas or board of the painting. The artist for many years has been working with a professional framer, and together they match the frames to the paintings. Every painting is therefore framed according to its character. They use materials of the highest quality with respect to the latest trends in the world of framing. When you order a framed painting you have confidence that you are getting a finished, harmonious piece of art. 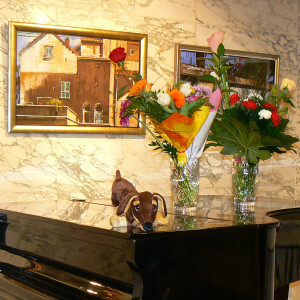 We offer you paintings from our gallery as well as works painted upon request. In the case of a request, it can be a portrait, but it can also be a work on some topic, some variation and inspiration touching issues or values important to you. Of course, these are always original works by the artist, possessing her distinctive line and craft, but they can be inspired by either certain people or issues or events, and in the same way they express special content and the values of the individual buyers. It is possible to use various techniques (pastel, oil paint, drawing), various surfaces, and various formats. We also offer a perfect selection of frames for the paintings. We can prepare custom paintings within a few weeks. Paintings can be picked up in Kraków, and we can also send them anywhere in Poland or abroad. We have much experience in packaging paintings, so you don’t have to worry about damage to the work during transportation. Regardless of the size and type of frame, we can protect the painting so that it reaches its destination intact. Wernisaż w Bratysławie, 2014 r.
A painting is a special gift. It can’t be arbitrary. It should make the recipient glad, but the person who buys the gift, after all, has to choose it, so the work also conveys the emotions of the giver. Perhaps you will find in our gallery something you’d like to give to someone. If you don’t find what you want, or not exactly, we can try to offer something special, something that will suit your imagination or feelings. 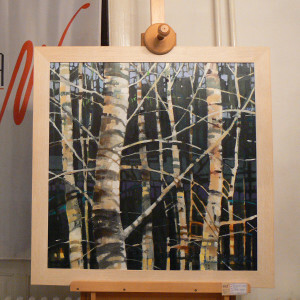 Bernadetta’s paintings have a positive energy in them that lighten up the surroundings and make everything right. They are good not only craft-wise—they are simply good, and they are also attractive. What’s more, they are exceptional works of art. Each painting is unique, and hidden behind each painting is some story. They are the kinds of paintings you want to have and are able to have and enjoy. You can give them and share their beauty. They may be exactly what you need. In any case, it’s worth asking.